THEY ARE LESS WELL KNOWN than their counterparts in the world of foreign affairs, the mandarin caste of experts who cycle in and out of government and provide the brainpower behind American foreign policy. But immigration policy also has its mandarins, and Susan Martin is one of the most distinguished. Research Director for the Select Commission on Immigration and Refugee Policy (it provided the blueprint for the landmark Immigration Reform and Control Act in 1986), later executive director of the U.S. Commission on Immigration Reform, she is a respected scholar who has had a ringside seat on three decades of behind-the-scenes policymaking. A Nation of Immigrants is a relatively slim, readable volume summing up the lessons she learned in the course of that career—a thumbnail history of American immigration since the founding of Jamestown in 1606, seen through the prism of Martin’s personal politics and forcefully argued ideas. It is not a book for casual readers—Martin is the policy world’s equivalent of a lawyer’s lawyer. Still, it is a commanding and impressive account of economic, demographic, social, and political history. It is also a sobering story. Essential as immigration has been to our history, prevailing American opinion through the centuries has been anything but welcoming toward newcomers. Martin cites not just the famously skeptical Benjamin Franklin (he opposed German immigration as early as 1755) and Theodore Roosevelt (he railed against hyphenated identities and wanted to deport any newcomer who failed to learn English in five years), but also an array of other American giants—Thomas Jefferson, Alexander Hamilton, Woodrow Wilson, and even to a degree FDR—who were dubious or downright opposed. The Know-Nothing Party that emerged in the 1840s in response to new waves of German and Irish immigrants managed to elect eight governors and more than a hundred members of the House of Representatives. The restrictionist crackdown of 1924, slamming the door on immigrants from southern and eastern Europe and drastically reducing legal inflows until 1965, was no historical fluke or right-wing coup: it was more than four decades in the making and widely popular. Every fresh wave of newcomers to the United States has triggered a broad-based backlash. Immigration has been a wedge issue—maybe the quintessential American wedge issue—since before 1776. And if public opinion had had the last word, we would not be a nation of immigrants. Martin tells the tale chronologically, and she is an able and efficient storyteller. Among the episodes that stand out are the economic and political developments in Europe that drove eighteenth- and nineteenth-century immigrants to America; the rise and fall of the early twentieth-century Americanization movement; the growing indifference and isolationism that barred Jewish refugees from Nazi Germany and culminated in 1939 in the return of the ocean liner St. Louis—all these stories are sharply etched in just a few densely packed pages. But the book is as much an argument as a narrative, and in this it is somewhat less successful. Martin organizes her vast canvas with a typology borrowed from the colonial era. In her view, “America has been settled from its very origins by three different models of immigration.” The Virginia model imported workers, including indentured servants and slaves, but denied them full membership in settlement society. The Massachusetts model screened newcomers on the basis of faith, accepting only those who embraced the established religion in the colony. The Pennsylvania model was open to anyone regardless of religion, promoting tolerance, pluralism, and full membership for all. Subsequent American history is presented as a shifting kaleidoscope: the approach in any given moment either a relatively pure or mixed form of these three elements. The recent Bush years seem to Martin a mix of Massachusetts and Virginia, with the Patriot Act sanctioning unfair treatment of Muslims while illegal immigration created an expendable underclass, foreign workers living among us but not as members of our society. This theoretical framework works up to a point. The three models provide Martin with a useful shorthand. She isn’t wrong that the three strains have been present from the beginning, and that they come and go with striking regularity. But the types are oversimplified, and they give rise to a disturbingly Manichean view of the rest of American history. Take the Massachusetts model. It is not wrong to read the history of that colony, as Martin does, as a story of exclusion and persecution. But it can also be seen as an early New World example of what is surely America’s crowning and most influential ideal: organizing a political community not along blood lines or by ethnic origins, but rather around members’ belief in a set of shared ideas. For Martin, the Pennsylvania model is only good, the Massachusetts and Virginia models only bad. She hardly has to examine or think through any later era’s approach: it is enough for her to decide that it follows the Massachusetts or Virginia template and it is pernicious. Owing to the way she sets up the categories, the mere mention of an ideological test or an economic rationale is enough to remind readers of the horrors of Puritan persecution or chattel slavery. Martin has a particular blind spot when it comes to economics. The book never looks squarely or directly at contrasting economic views of immigration—an inexplicable omission. With one somewhat tendentious exception, none of today’s leading immigration economists are mentioned even in passing. And in Martin’s telling, even the immigrants of ages past invariably undercut American workers, taking Americans’ jobs and lowering their wages. Martin is not falsifying the evidence—she’s too serious a scholar for that. But again and again she tells only one side of the story. She accepts at face value and without question the labor union view of any episode and any dispute with business. She assumes, again without question or nuance, that American employers are exploitative. And deft as she usually is in sorting through arguments, her economic history is distressingly selective. Among the most interesting analyses she cites is the one by the leading economic historians Timothy J. Hatton and Jeffrey G. Williamson. Their book, The Age of Mass Migration, which appeared in 1998, does indeed argue, as she claims, that late nineteenth- and early twentieth-century immigrants competed directly with unskilled Americans and probably lowered their wages, perhaps significantly. But Hatton and Williamson also show that the presence of these foreign workers in the United States attracted significant foreign capital—capital that built the American industrial economy and created jobs for untold American workers. That point is conveniently left out of Martin’s account. Martin’s fundamental values are not wrong. The traditional American way of immigration—the approach on which the nation was built—worked because it was inclusive rather than exclusive, pluralist rather than sectarian, legal rather than illegal, and based on the ideal of membership. Newcomers came, in Martin’s words, as “proto-citizens”, not as “indentured laborers.” The fact that we encouraged most of them to assimilate as Americans is what guaranteed their success—and ours. Today’s large-scale illegal immigration undermines that ideal, and it must be stopped. Still, many of the policy ideas that Martin derives from these values are questionable at best. Not all labor-market migration is exploitative. Even in a downturn, the nation needs foreign workers—to grow our food, care for our elderly, and develop the technology of the future. And we need an array of visa programs that admit these workers for both the short and the long term. Martin is correct that we should make every effort to avoid treating immigrants as a caste apart. But giving them the same welfare benefits that we grant citizens, as she advocates, is untenable politically—and taken together, her recommendations would seem to encourage just the wrong kind of newcomers, luring welfare recipients while turning away needed workers. Perhaps most misguided, in my view, is her approach to the number of immigrants we should be admitting. Martin cites no specific figures, but in keeping with the recommendations of the Hesburgh and Jordan commissions, everything she says points in the direction of radically lowered immigration quotas—ceilings that I believe would have stifled the economic growth of the 1980s and ’90s and, if imposed in coming years, would choke the nation’s economic recovery. 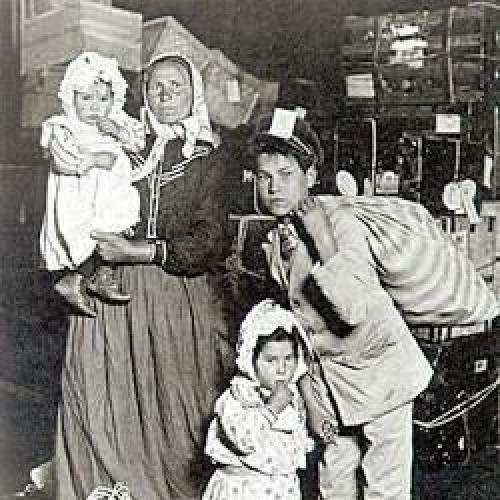 A Nation of Immigrants is an exemplary synthesis and interpretive history of its urgent subject. It is also a deeply considered and thought-provoking book. I believe many of its policy recommendations are dead wrong, but in today’s confused, emotionally inflamed immigration debate, Martin’s illuminating analysis cannot be ignored. Tamar Jacoby is the president of ImmigrationWorks USA, a national federation of small business owners in favor of immigration reform.